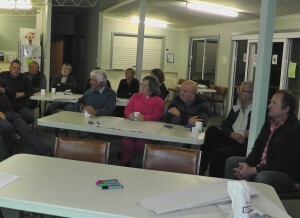 The Loddon Plains Landcare Network held a strategic planning workshop on Thursday 4th of July at the Serpentine Bowls Club. The workshop was a chance to bring together different perspectives around one table to explore strategic themes and identify priority actions that will guide the Network in the next 1-3 years. With 20 attendees, the various member groups of the Network were well represented at the evening. After a hearty meal, Mal Brown facilitated the discussion for the attendees, focusing on major operational areas that the Network undertakes. The discussion yielded some great thoughts and ideas. The strategic plan will be prepared by Mal Brown and LPLN Facilitator Anthony Gallacher, to be presented at the August Committee of Management meeting. Thank you to all those who attended the evening and made such a valuable contribution to the discussions. A pdf copy of the evening’s presentation can be downloaded here. Photo: workshop attendees at the strategic planning evening.